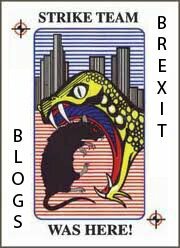 Every now and then then I lose the thread of Brexit because there's so much noise it's difficult to work out if there have been any developments and then when something finally does happen it takes you by surprise because usually what the people who write the news think is news is not actually news and the only real news is that there have been no developments. The main development today seems to be that there will be no new negotiating mandate given to Barnier by the EU27 but that is only really news people who expected they might, which in the main was media speculation born of their own ignorance. Since I never expected it to happen it wasn't something to watch. Meanwhile for all that we have heard much noise from the ERG and Dominic Raab, one gets a sense that we are simply treading water - winding down the clock to that final hour where the decisions must be made. The rest is little more than propaganda noise to hold the fort. The drip of no deal warnings has become a torrent - while Brexit activists continue to grunt "project fear" despite businesses starting to vote with their feet. In the background we continue to see Tory MPs running with the "Chuck Chequers" meme, referring back to Lancaster House - either pretending a Canada FTA is on offer and there for the taking, or simply not understanding why an FTA is wholly inadequate to our needs. The public debate on Twitter is in the paddling pool and the remainers are really only talking to themselves pushing for a referendum that simply isn't going to happen. In all this, one simply doesn't bother looking at newspapers for information. The only reason to look at them is to get an idea of how the media is misinforming the debate. It doesn't help either that insomuch as I am catatonic with Brexit boredom, the rest of the nation is as well. I notice my Facebook feed is discussing just about everything but Brexit. Right about the time when we can't afford to have people tuning out. This is as much to do with an overall sense of bewilderment because the even the most basic technical nuances of trade don't filter through to reach Mr and Mrs Average. Last weekend I had dinner with friends (yes I have some) over in Reading. Joining us were a couple of ordinary senior citizens, both of whom voted remain, but not especially political, remarked that they thought the EU seemed to reject anything the UK presents. This, I expect, is probably the common perception and though the Tories may be lying to our faces about EU intransigence, it is a highly believable narrative and one that is not easily dispelled without explaining the finer details - which is beyond the understanding of Mr and Mrs average. Being that it is impossible for most people to know what is and isn't true out of all the warnings people are left to take their best guess. Here it is easy to see how the ERG is losing ground. If even half of the warnings are true, and most of them are, then there can be little appetite in the country for no deal. As the clock ticks down we will see a new urgency. Whether it has any bearing on the outcome is anybody's guess. This government has been deaf from the beginning and there is no sign of change.